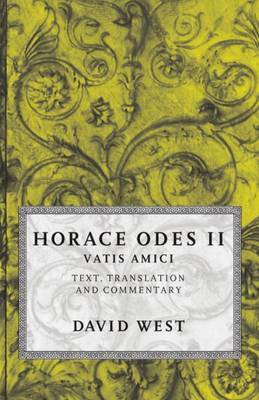 In these odes Horace creates lyric poetry in Latin which stands comparison with anything written by his brilliant predecessors in Greek. Of the three books published together in 23 BC the second is in many ways the most rewarding. The first ode, for instance, looks back at the civil wars fought by Caesar and Pompey, and by Octavian and Antony, from the point of view of Horace and his friend Pollio who both took part in them. There are also poems of friendship which give insight into the social and intellectual tone of the age of the first Roman emperor Augustus, and Horace's unique, elusive sense of humour is in evidence throughout. This book contains the Latin text (from the Oxford Classical Text), a translation which attempts to be close to the Latin while catching as much as possible of the flavour of the original, and a commentary which tries to suggest how these poems work as poetry.